For the first 50 years or so of Hamilton's existence it was known as the "The Watch of Railroad Accuracy" and their reputation for highly accurate and thoroughly designed time pieces was well earned. It was said that you could take 100 Hamilton watches completely apart, mix up the parts and then reassemble 100 working watches again. That degree of precision and repeatability was almost unheard of in an industry where watchmakers traditionally fitted a movement one piece at a time. It was also why Hamilton became known as the Patek Philippe of the United States. After World War II the ability to fly from city to city, or even coast to coast, was within the reach of the common man. Being the watch of railroad accuracy was no longer that significant. Of course, Hamilton had quite a reputation for aeronautical navigation - but that's a topic for another day. 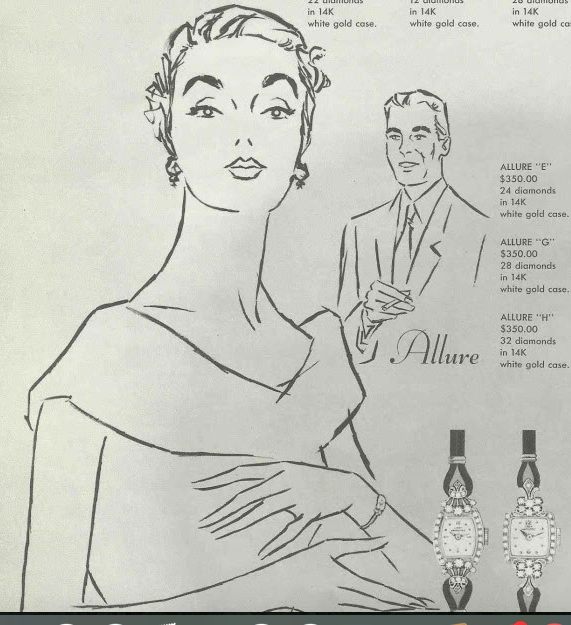 Hamilton's marketing evolved in the 1950s to promote watches as fashionable mechanical haute couture. If you wanted a watch that would just tell time, buy an Elgin or Waltham. If you wanted a timepiece of distinguishing taste, buy a Hamilton. Many mens' and ladies' models where introduced with high quality diamonds in addition to their solid gold or platinum cases. Some glamorous watches were only available with diamonds while others were diamond-laden versions of other high end models. A good example of the latter is the Bradford B Masterpiece. It was introduced in 1957, four years after the original 1954 Bradford was unveiled. To underscore the prominence of Hamilton's diamond models they were identified as part of the "Masterpiece" line. The Bradford B Masterpiece retailed for two times the cost of the regular Bradford B. 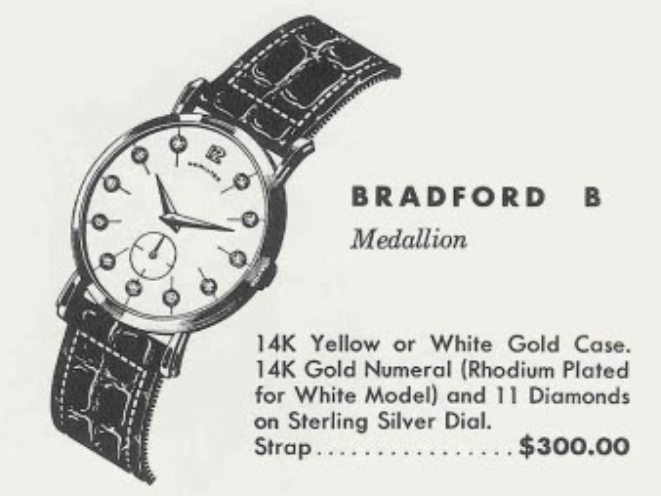 The B-model was the version of the Bradford that was outfitted with the 22 jewel 770 movement, when it was introduced in 1955. 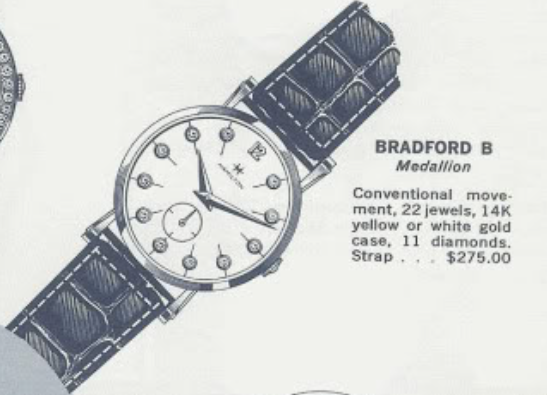 The original Bradford has the earlier 17 jewel 747 movement. 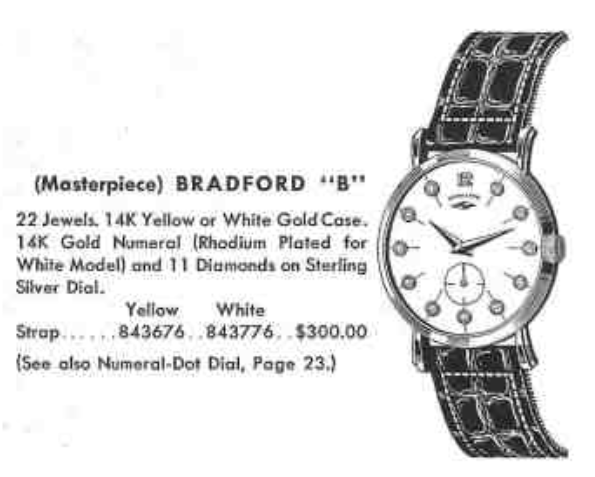 Only the Bradford B has the diamond dial. The Bradford B diamond version was rebranded in 1960 as the Bradford B Medallion and continued to be produced through 1962. If you see a gold diamond-shaped marker under the 12 on the diamond dial then it's a 1957-1959 "Masterpiece" version of the model. Without the marker it's from the Medallion timeframe of 1960-1961. The retail price of $300 was consistent throughout the production period until the final year. In 1962 the price was reduced to $275. That was still the equivalent of over $2,200 in today's dollars though, so it was not an inexpensive watch. Due to it's significant price point you don't tend to see the Bradford B Diamond very often. It seems like on any given day you can find private-labeled re-cased Hamilton movements with diamonds on the dial but finding a true authentic model is another story. The Bradford B was also produced by the Awards Division so it's a fairly ubiquitous model in yellow gold. Finding a white gold version is harder to do, in my opinion. With that in mind I jumped at the opportunity to buy a Bradford B Diamond when I saw one for sale. I think I got a good deal to, since it's didn't quite look correct and looks more like a private-label jobber. One issue with my watch that is easy to spot is the dial has been incorrectly refinished. It has the wrong Hamilton font and it's missing the details around the diamond markers and the circular seconds register. Looking at the back of the case, it's clearly marked Hamilton though - a jobber case won't say that. If the font and lack of details didn't convince you that the dial has been refinished, the notch at the 3 position is another clear tell. The 770 movement appears to be in good shape, although it's very dirty and has some sort of funk oozing out from the winding wheel. The back of the dial has oil or something on the underside. The scratched-in numbers on the dial are also a clue the dial has been refinished - if there was any remaining doubt. The dial-side of the main plate has some congealed oil near the mainspring barrel arbor so maybe the excess leaked out of the barrel? The inside of the case back shows signs of a repair. I don't see any obvious marks on the outside so whatever happened was repaired well. The mainspring inside the barrel has no signs of excess lubrication. I wonder where all the extra oil came from? Everything gets cleaned and dried. All the parts looks a considerably more sparkly after a trip to the spa. The reassembled movement is ticking away with good motion. It's off to the timer to listen to the ticking. After a quick tweak to the regulator the beat rate was increased to a mere 4 seconds fast per day. The amplitude and beat error look great. A fresh crystal is always a nice way to spruce up a watch. 29.3mm diameter should do nicely. One of the reasons the original watch looked funny was it had the wrong style and size hands. As a general rule of thumb, the hour hand should just barely reach the closest hour marker and the minute hand should just clear the closest hour marker. On rectangular watches the hands can look short at times like midnight or 6:00 when the hour markers are farthest away from the center. However the hands need to be short to accommodate times like 3:15 or 9:45. Round watches enjoy longer hands because all of the hour makers are the same distance from the center. This watch should have dauphine hands and you can see in the shot below that new hands are a big change. The holes in brand new hands sometimes need to be sized for the hour wheel and cannon pinion. That's accomplished by using a broach and a hand holding tool. Sizing hands is a very basic watchmaking task but that doesn't mean it's easy. If the holes are too big the hands will move when the watch is jarred and get out of alignment (so they don't come together at midnight). Wow! What a difference new hands made! A nice lizard strap and a scratch-free crystal help too. Now the question is should I go the distance and get the dial refinished to it's proper specs? It doesn't look too bad as is... what do you think?